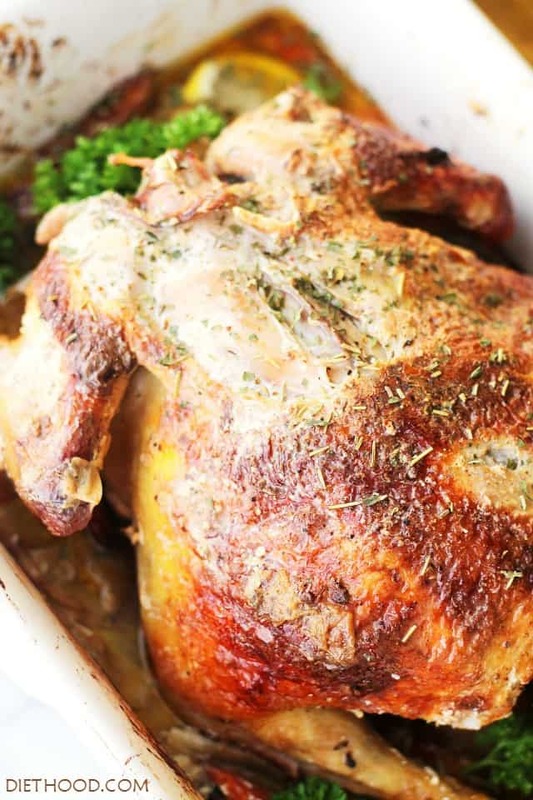 Roast Chicken Stuffed with Garlic and Rosemary Cream Cheese – Easy recipe for Roast Chicken stuffed with a delicious mixture of cream cheese, rosemary and garlic. Happy Sunday, Friends!! How goes it?? How’s your weekend so far? …but I spent most of my weekend listening to my 1999 mix-CD appropriately titled, “Summer of 1999”. I danced as if nobody was watching and sang as if nobody was listening. ‘Cept that my daughters were watching and listening… and they joined me! We partied like it’s 1999! Pun intended. I’m a geek. And now, I can’t get Livin’ La Vida Loca out of my head, and I can’t stop shakin’ it to Hit Me Baby One More Time. Suddenly, 90’s music is starting to look better than 80’s music. Is that even possible?!? Also? This is my workout-CD, as well. During Engrique Iglesias’ Bailamos, I run like a hamster on my treadmill, and rock thy hips better than Shakira. Sooooo. 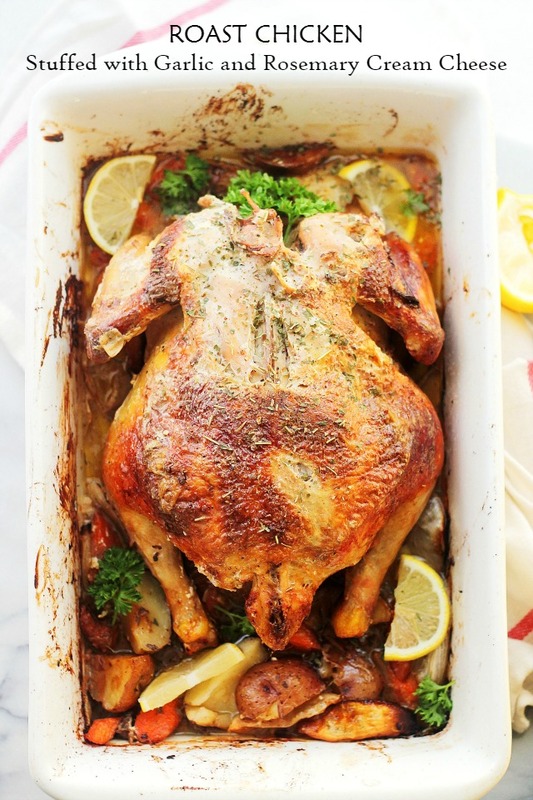 Roast Chicken! You should really make this! I know. I say that all the time about all my recipes, but I mean it. I always mean it. But, really? This tastes like Heaven. Not that I know what Heaven tastes like, but if it had a flavor, this Roast Chicken would probably be IT. My mom, the one that practically laughs at people who eat boneless, skinless white meat chicken, is the reason why I made this pretty bird. They were coming by for dinner last week, and because my Dad looooves chicken, but my Mom loves it only if it’s covered in crispy skin, roasting a whole bird was the obvious answer. Normally, I rub some butter underneath the skin, as well as some herbs, but this whole cream cheese idea was kinda brilliant. I mean, there’s just so much to be said about this. I served Toots with a side of those delicious veggies living under her, and some homemade dinner rolls to sop up all that liquid – MY FAVORITE PART!!! IF you have like 15 minutes to prep, make this today. Seriously. It takes 15 minutes to get it ready and about 1.5 hours to cook it. Easy Peasy! 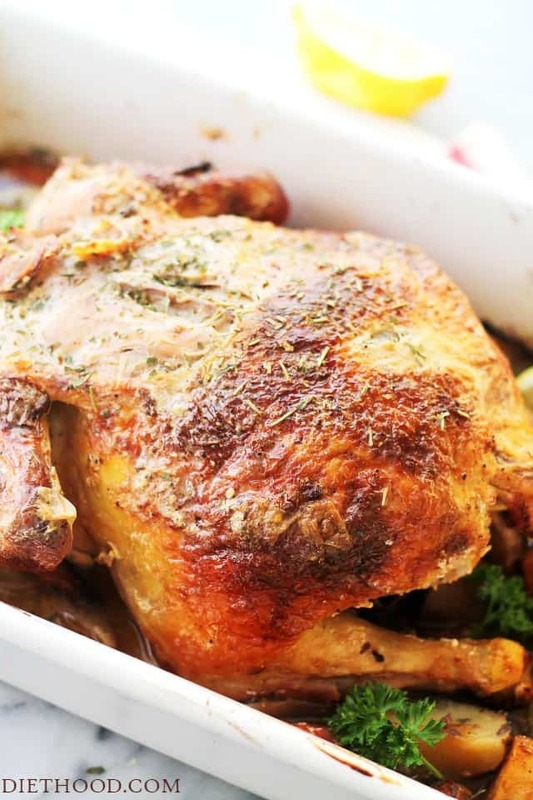 Easy recipe for Roast Chicken stuffed with a delicious mixture of cream cheese, rosemary and garlic. Wash and completely dry the whole chicken. In a small mixing bowl, combine cream cheese, rosemary, chopped garlic, and ground pepper; mix until creamy and combined. Using your fingers or a spoon, spread the cream cheese mixture under the skin, around the entire bird, out to the thighs and legs. I find it easier to spoon a large chunk of the cream cheese under the skin; then I use my fingers to spread it around by rubbing the chicken on top. Place slices of lemon inside the cavity and set aside. Butter a large baking dish with one tablespoon butter. Place potatoes, carrots, onoins and garlic in baking dish; toss with salt, pepper and olive oil. Place prepared chicken on top of veggies. Sprinkle salt over chicken and drizzle with a little bit of olive oil. 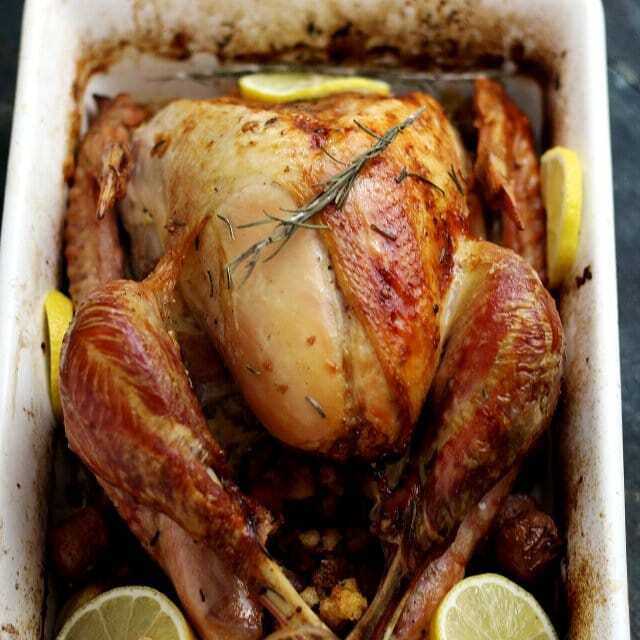 Remove from oven and carefully flip the entire bird. Bake for 20 to 30 minutes more, or until lightly browned. Transfer veggies and chicken to a large serving dish; spoon juices over chicken. I’ve never roasted my own chicken but this sounds like the best way to do it! I love cream cheese. 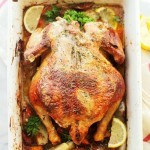 Roast chicken has never looked so good and I love those veggies roasted right in the pan! Loving the flavors and can’t believe how easy this is to make. And thanks for putting those songs in my head! You’re right – the cream cheese idea was brilliant. What a gorgeous bird! One word…DROOL! Happy Sunday babe..I am coming right over! :D Awesome pictures Kate! It sounds like a lovely and very flavourful bird indeed. 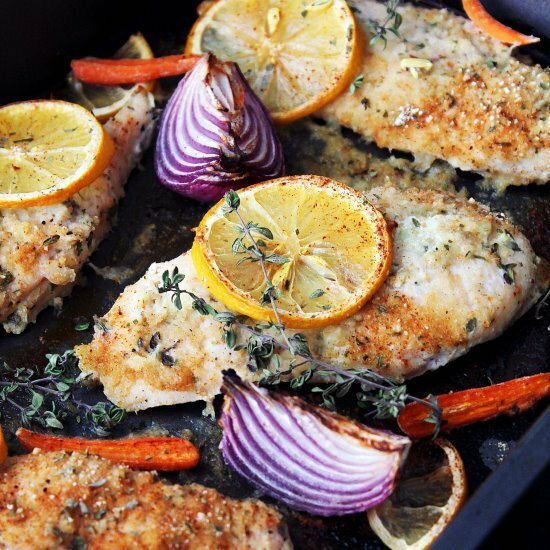 So many flavors going on here with this chicken! Roast chicken is my favorite! Pinned!